Asaph Hall III (1829 – 1907) was an astronomer working at the US Naval Observatory on the banks of the Potomac River in Washington, D.C. in 1877, and was in charge of their 26-inch telescope, then the largest refractor telescope in the world. Hall spotted a “faint star near Mars” on August 17 and later identified it as a moon – another moon, actually, since Hall had already identified the smaller Deimos on August 11. That’s two moons in one week! Not too shabby for a self-taught astronomer from Goshen, Connecticut who dropped out of school at 16. Hall was clearly no slouch. Despite leaving school early to apprentice as a carpenter, he later studied mathematics at New York’s Central College and in 1856 got a job at the Harvard College Observatory, where he became very good at computing orbits. A year after becoming assistant astronomer at the Naval Observatory in 1862 he was made professor. Hall published almost 500 papers, including studies of double stars, the mass of Mars, Mercury’s perihelion, natural satellites, Saturn’s rings, solar and stellar parallax, and the value of pi. He also identified the rotational period of Saturn and described the retrograde motion of its moon Hyperion. Hall taught celestial mechanics at Harvard until 1901. One could say his astronomical abilities were… well, astronomical. Astronomers are still unsure of where Phobos came from. Did it form with Mars as a planet? Is it a captured asteroid, now trapped in orbit? 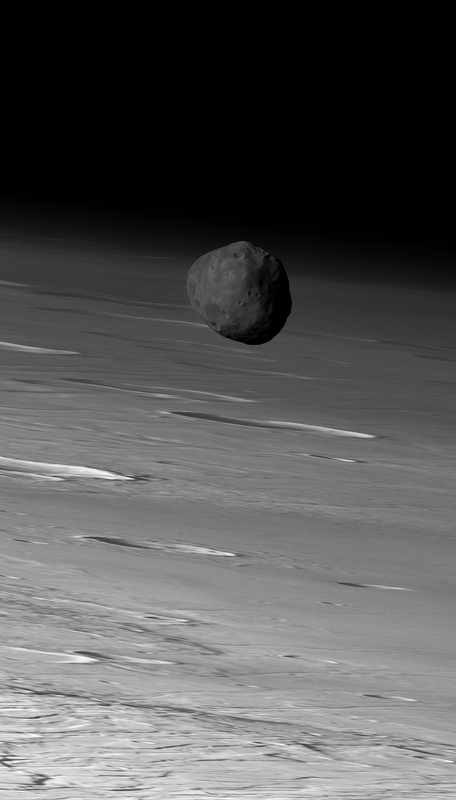 Or is Phobos a chunk of Mars flung into orbit from an impact? (Or… maybe it’s an ancient alien spacecraft?? Just kidding.) Wherever it came from, as a moon Phobos is an oddity. In addition to its small size – only 16 miles across at its widest – low reflectivity (albedo) and irregular shape, it orbits its parent planet at a rather low altitude, only 5,840 miles (as compared to our own Moon’s 248,000 mile distance) and thus needs to travel at a very high speed in order to stay in orbit. It is actually orbiting Mars overthree times faster than Mars rotates, and rises in Mars’ western sky. Its orbit is so low, in fact, that it can’t even be seen from the polar regions on Mars! It’s estimated that Phobos’ orbit is steadily decreasing in altitude and will eventually impact Mars’ surface or be broken up by tidal forces, perhaps becoming a thin ring of debris around the planet. What’s fascinating is that just over 134 years ago people didn’t even know Mars had a moon (nevermind two) and now we’re able to see images of it in incredible detail from close proximity… and soon even study the surface itself! I’m sure Professor Hall would have approved. Image credits: ESA/DLR/FU Berlin (G. Neukum). Animation by J. Major. How big would Phobos look if you were standing on Mars around the equator? Seems like it might look fairly big, despite how small it is. It would be awesome to see it streak across the sky. it should be about 10′, one third of width of our moon (based on diameter 16, distance 5840 – the closest possible approach, straight above your head). I assume that Phobos is losing orbital energy due to atmospheric drag? Negative. Phobos’ orbit is deteriorating due tidal deceleration, because Phobos’ orbital period is shorter than Mars’ rotational period. The two dates you indicate for the discovery of Phobos, “If someone were to ask you when fear was first discovered, you could tell them August 11, 1877.” and the next “Hall spotted a “faint star near Mars” on August 17 and later identified it as a moon – another moon, actually, since Hall had already identified the smaller Deimos on August 11. That’s two moons in one week!”, do not agree with each other. This would seem to make your first date in error.